Depending on where you are in the world, this week’s partial eclipse of the Full Moon in Aquarius will occur between 7 or 8 August. In Singapore, the partial eclipse hits its peak on 8 August at 2:20 am. The Earth’s South Node is currently in Aquarius. The South Node is associated with karmic debts, the ghosts of the past, the old wounds and issues that stand in the way of our soul’s progress. Full Moon energies are associated with completion, fulfilment, and release. This Full Moon is in Aquarius, i.e. the current South Node. Eclipses work as energetic reset buttons. As the shadow of the Earth falls across the Moon, so too are our shadow aspects energised + amplified. The parts of ourselves that are unhealed, unenlightened, stuck in the past – they come out of their hiding places to seek healing, resolution, and closure. So if you’ve been feeling particularly down lately and it seems that the old problems are just not going away, hang in there. Your shadow aspects, your crosses to bear, your karmic burdens, they are here again – not to trouble you, but to offer you an opportunity to transcend them. To forgive. To let go. To stand up for yourself. To love your inner child. To cut off toxic people. To end destructive habits and patterns that do nothing but drag you down. Just a heads up – Mars, the Celestial Warrior, is in Leo. In opposition to this eclipse. Hackles will be raised, tempers possibly flaring. People will be feeling defensive about their vulnerabilities coming out to play at this time, and some folks are likely to spend this eclipse embroiled in some kind of fight or confrontation. Pick your fights wisely. if you start a fight, be sure you know how to end it. On the bright side – and there’s always a bright side – you can make this world a better place. Aquarius is the sign associated with friendships, humanitarian causes, the greater good. An eclipse in this sign boosts our mindfulness of the Spiritual truth of The Universal Brother/Sisterhood of Humanity. Like it or not, in many ways, we all are one. This is a great time to undertake acts of kindness, generosity, and charity for our fellow human. In many ways, we all are one. And you don’t have to be Mother Theresa to do something kind – a small donation to your favourite charity, a phone call or visit to a friend who needs cheering up, an offer to share your brownie with the office newbie (halves the calories, too!) – all these are ways we can raise the vibration of our lives, and the lives of those around us. 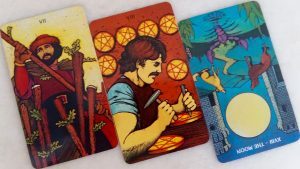 Let’s get to This Week’s Tarot. Here we go! LEFT: SEVEN OF RODS. This is the card of self-assertion. What you desire can be yours; how you will attain it, and what form it will take, depends on the extent to which you act in your own best interests. You may be questioned or criticised for your choices, but stand firm. MIDDLE: EIGHT OF PENTACLES. On a literal level, this card is associated with mastery of a skill and/or further development in studies + career. When this card appears, you are assured that the Universe sees your efforts, and is cheering you on to keep at what you’re doing. On another level, you may be working on yourself – be it a strict diet + exercise regime, quitting a bad habit, taking breaks from social media – and the Universe wants you to know you’re doing well. Keep going! RIGHT: THE MOON REVERSED. When the Moon hangs upside-down, clarity is coming into a situation that you previously found dangerously confusing. It could be that part of the confusion arose from your reluctance to trust your intuition. Thankfully, that time is over. It is safe to trust your Higher Self – and act accordingly. A quick look at the numerology of this spread: The Moon is Major Arcana Eighteen, which reduces to a Number Nine (1 + 8 = 9). So we have 7, 8, 9… Notice how the numbers in this reading seem to be rising in some kind of cosmic countdown? In numerology, 9 is the number of completion + closure in the earthly realm. 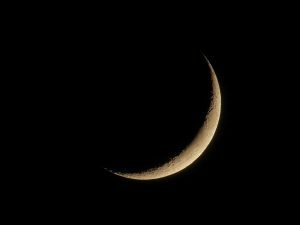 This all fits in with what I said earlier about the partial eclipse of the Full Moon this week – certain issues and cycles are coming to a head this week, and possibly coming to an end. It all depends on what you choose, and how you act.